I made this card for our son ( I also made one for our daughter). 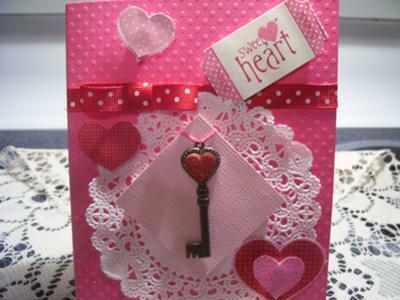 Using the hot pink paper by Bazzill as the main card I added the hearts and put them on with pop up dots. I hot glued the ribbon and bow across the upper part of the card. I then added the ticket in the center and glued the doily. 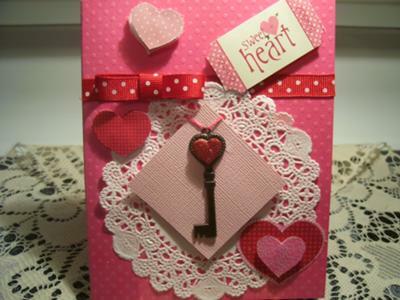 I added a light pink piece of stock paper and glued the Key with a pink twine on it. I added more cut out hears and stacking them to finish off this card. I hope you enjoy this and all of my cards, as much as I do creating them . Come and visit me at my blog, Something Crafty by Dottie and maybe even become a follower.